Stop throwing away old dull kitchen knives. Now you can restore the life of your oldest knife just like the day you bought it, with the amazing Kleva Sharp original knife sharpener. 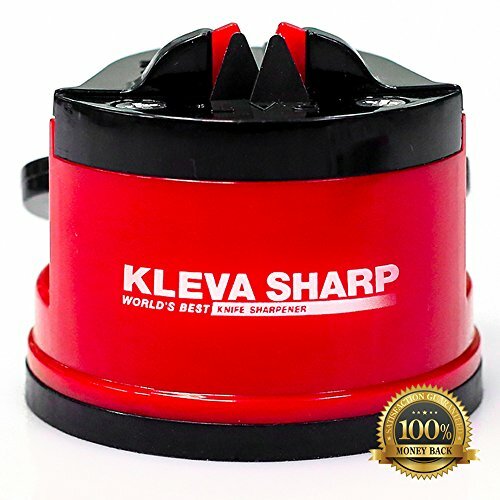 The Kleva Sharp Knife Sharpener launched in 2009, is the original and the World's Best Knife Sharpener on the market. With the incredible suction cup base feature, it suctions to any smooth dry surface including splashbacks, tiles, benches, fridges and more and can even be done one handed so your hands never go near the blade. Small and compact it's size has a small footprint, so it remains discreet on your bench or tucks away nicely in your drawer. Forget sharpening steels and stones, that are downright dangerous or impossible to use. The Kleva Sharp V Shaped Tungsten Blades are set at the optimum angle to sharpen even your dullest blade. Set your sights on sharpening more than just the knives in your drawer, sharpen blender blades, peelers and even rusty old garden secateurs. Keep one in the kitchen, one in the shed even one in your tackle box. Perfect also for caravanning and camping. Look for the genuine Kleva quality seal, and you'll know it's real! 100% customer satisfaction guaranteed or your money back. MAKES AN OLD KNIFE CUT LIKE NEW- Sharpen the dullest knife in your drawer even Grandmas' blunt butter knife. SET AT THE PERFECT ANGLE- the v shaped tungsten carbide tooling is set at the optimum angle so there's no skill required. If you have any questions about this product by Kleva Sharp, contact us by completing and submitting the form below. If you are looking for a specif part number, please include it with your message.